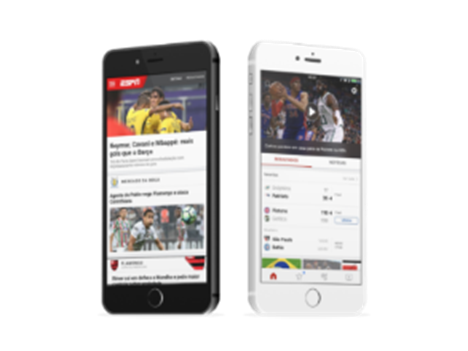 ESPN has launched the Brazilian edition of its flagship ESPN App for iOS and Android, part of a newly relaunched suite of digital products in the Brazilian market. The new Brazil edition of the ESPN App, along with ESPN.com.br, brings together the richest and most comprehensive collection of ESPN multimedia content to fans in Brazil, and allows them to further customize their news, scores, information, alerts and more from the teams and leagues that matter most to them. The Brazil edition of the ESPN App showcases ESPN’s unmatched content portfolio of sports news, video, and analysis within a one-stop digital home, delivering a streamlined, personal experience along with the capabilities and functionality that have helped make ESPN the leading digital sports platform in the world. Now available in a dozen localized editions and multiple languages around the world, each edition of the app is powered by a combination of local editorial and production teams and ESPN’s global sports news organization, ensuring the best coverage of locally relevant sports, as well as the global sports landscape. As ESPN’s second largest digital market in the world (behind only the U.S.), the Brazil edition of the app represents the latest step in ESPN’s development of a truly global digital platform that powers local editions of signature ESPN digital properties. The new app and website also reflect ESPN’s leadership in developing for mobile platforms, a key area of growth in Brazil, where ESPN’s audience on smartphones has grown 39 percent year-on-year (comScore, 2017 vs. 2016). The growth of digital content consumption via smartphones was also noted in the growth of WatchESPN, ESPN Brazil’s live streaming platform, which saw traffic grow 74 percent between 2016 and 2017. The launch of the Brazil edition of the ESPN App expands ESPN’s platforms in Brazil, which includes four pay TV channels (ESPN Brasil, ESPN, ESPN+ and ESPN Extra), ESPN.com.br, and WatchESPN for iOS, Android, and via the ESPN.com.br/watch website.